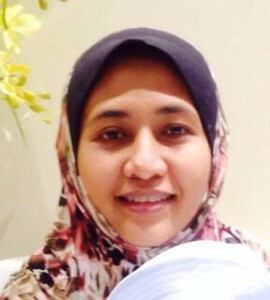 Hafiza Abas is a researcher, lecturer, trainer and writer at Advanced Informatics School (AIS) Universiti Teknologi Malaysia, Kuala Lumpur. She is actively conducting researches and writing books in addition of teaching and supervising students. Hafiza has produced a number of books, teaching modules, a translation book, journals and has participated in several conferences and research exhibitions in national and international levels. Among the books that have been published are “Mudahnya Camtasia”, a collaboration with Dr Faridah Hanim and Prof Dr Zulikha; novellete “Amanda Help Me!”. She has just completed two books entitled ” Bahasa Melayu untuk Murid Disleksia” and “Panduan Guru: Masalah Pembelajaran Spesifik Disleksia”. She has been involved in national and international conferences as a member of the committee and paper reviewer. Her research interests are related to students with learning disabilities such as dyslexia, remedial students and autism; in reading recovery and using computer applications such as apps, multimedia, web and augmented reality. She is also a certified software tester in CP-MAT (Certified Professional – Master Agile Testing). You can access her website through the given links: http://www.ais.utm.my/hafizaabas/ and http://hafizaabas.weebly.com/. with their wealth and their lives are greater in rank in the sight of Allah.